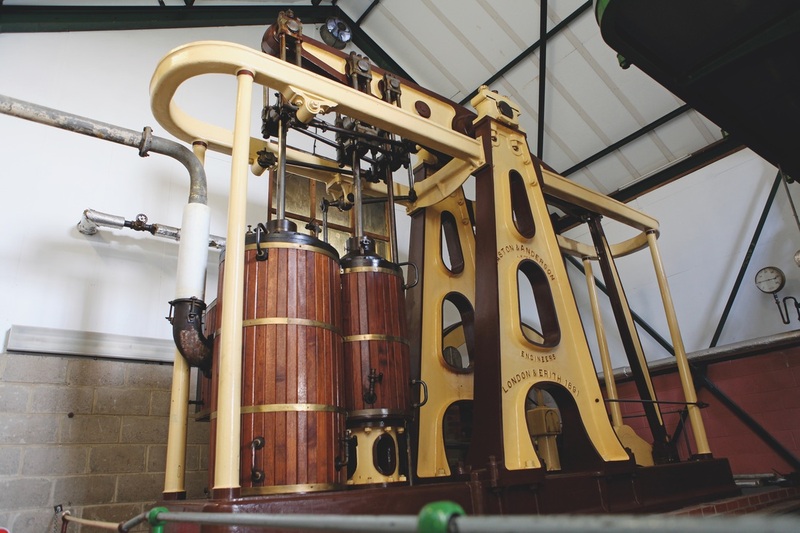 The Roall Engine was acquired by the museum in 1987 from the Yorkshire and Anglian Water Authorities. It was removed from the Roall pumping station at Eggborough. The Roall Engine is an A-frame design. This name is derived from the two cast-iron A-frames that are used to support the centre bearings of the beam. making it relatively cheap and easy to install. The radius rods for the Watt parallel motion are attached to the U-shaped entablature frames supported by four slender columns. The arrangement of the two cylinders in the Woolf Compound Design means that both cylinders are connected to the same side of the beam, so that the stroke of each cylinder will be different. The well pumps were driven directly off the tail rod of the low pressure cylinder. TYPE Woolf Compound A-Frame Waterworks Beam Pumping Engine Station. 65 HP. BUILDER Easton Anderson, Erith. 1891. CYLINDERS HP. 14 inch X 36 inch Stroke. LP. 20 X 46. inch Stroke. VALVES Meyer expansion valve HP. Simple slide valve. LP. BEAM Single plate cast iron. FLYWHEEL 12 foot diameter. Cast in two halves. Weight 9 tons.